Opioids are the most broadly used analgesic drug to treat pain and other disorders such as diarrhea, cough, post-operative pain, and cancer. Although there are three types of opioid receptors (Mu, Delta, and Kappa), µ-opioid receptors (µOR) are the most commonly activated receptors in pain-associated pathways. µOR are G-protein coupled receptors (GPCR) that contain 7-transmembrane domains. These opioid receptors are bound to the endoplasmic reticulum. Upon activation by a ligand, the µOR translocates to the membrane in order to block potassium channels which causes cellular hyperpolarization. This in turn prevents the neuron from reaching its threshold for sending an action potential, thus preventing pain signals from being transmitted. The G-proteins have a GTP attached to them, which is hydrolyzed to GDP+Pi upon ligand binding. The protein will detach from the receptor and interact with effectors, such as cAMP downstream to amplify the signal. The most common endogenous ligand are beta-endorphins. Agonists include morphine and fentanyl and are synthesizable opioid ligands that provide the same endogenous effects as endorphins. In addition to the analgesic properties of these drugs, many opioid ligands such as morphine also activate the central dopamine pathways providing a sense of euphoria. This unwanted side-effect creates a lot of addictive behaviors, which drives researchers to look for other alternatives without euphoric effects. Further, a large difficulty in drug development is synthesizing a ligand that binds well to only the desired target receptor. Using crystal structures to learn how receptors convert from the inactive state to the active state upon ligand binding serves to address how well a receptor interacts with its substrate. Huang et al. (2015) manipulated ligand structures to develop a better understanding as to how the ligand affects the transition of µOR from its inactive to active state. However, we focus on the ligand, BU72 (4VO) in the activated µOR state. There are 4 extracellular and 4 cytoplasmic hydrophilic protein chains, and 7 helical transmembrane hydrophobic chains. The 7 transmembrane alpha-helices, 4 extracellular loops, and 4 cytoplasmic loops in µOR contain the amino terminus on the extracellular end and the carboxyl on the cytoplasmic end. The extracellular (ECL1-4) and cytoplasmic (CL1-4) protein regions are hydrophilic, whereas the transmembrane regions are hydrophobic (TM1-7). The µ-opioid receptor is a G-protein coupled receptor, however this complex has proven too difficult to crystallize when bound to a ligand. Instead, researchers were able to use a G-protein mimic in the form of a nanobody to crystallize the protein in its active conformation. Since the µOR is a GPCR, the receptor is not stable without the G-protein. Since the G-protein could not be crystallized, researchers crystalized the µOR with a camelid single-domain antibody that mimics the G-protein. There are both hydrophobic and polar interactions between the two proteins, where the blue represents the hydrophobic interactions. In the crystal structure, the nanobody also interacts with nanobodies of additional receptor-nanobody complexes. Based on the contacts between µOR and the G-protein mimic, one can see that the nanobody does not interlace deeply into the µOR intracellular domain. The hydrogen bonds formed are between the nanobody's residues I56, P58, T59, T69, S71, V102 and the µOR residues R179, N342, L176, P172, E270 in the CL2, Helix 8, and CL3 domains. 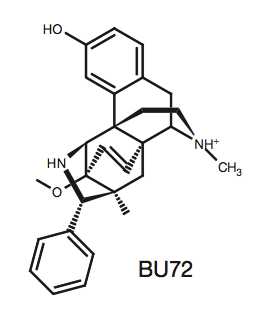 Bu72 (4VO) is a morphine-like agonist that induces similar effects to endogenous beta-endorphins. When BU72 binds to µOR, the receptor transitions into its active state. The interactions between the ligand and receptor are vital in drug development because the specific residues in the ligand binding pocket and their distances apart should be taken into consideration when designing substrates for the receptor. Most of the interactions in the ligand binding pocket are hydrophobic between the aromatic, phenolic groups of BU72 and residues: Y148, V236, V300, I296, W318, I322, Y326, W133, V143, and I144. The white on BU72 indicate atoms not interacting with the receptor's hydrophobic residues because they are nitrogen or oxygen. Instead, these atoms form the two polar interactions. The first interaction is water mediated between Y148, K233, H297, two water molecules, and the phenolic hydroxyl on BU72. The second polar bond is between Y326, D147, and the tertiary amino group on BU72. Additionally, the extracellular amino terminus forms a lid, covering U72 in the ligand binding pocket. The amino terminus residue H54 interacts with the ligand to form the lid, however, mutation of this residue shows that it is not sufficient for lid formation, meaning there are multiple other factors aiding to this conformation. Chen Y, Mestek A, Liu J, Hurley JA, and Yu L. (1993). Molecular cloning and functional expression of a mu-opioid receptor from rat brain. Molecular Pharmacology, 44(1): 8-12. Huang W, Manglik A, Venkatakrishnan AJ, Laeremans T, Feinberg EN, Sanborn AL, Kato HE, Livingston KE, Thorsen TS, Kling RC, Granier S, Gmeiner P, Husbands SM, Traynor JR, Weis WI, Steyaert J, Dror RO, and Kobilka BK. (2015). Structural insights into µ-opioid receptor activation. Nature, 524, 315-321. Zubieta JK, Smith YR, Bueller JA, Xu Y, Kilbourn MR, Jewett DM, Meyer CR, Koeppe RA, a nd Stohler CS. (2015). Regional Mu Opioid Receptor Regulation of Sensory and Affective Dimensions of Pain. Science, 293, 331-315.